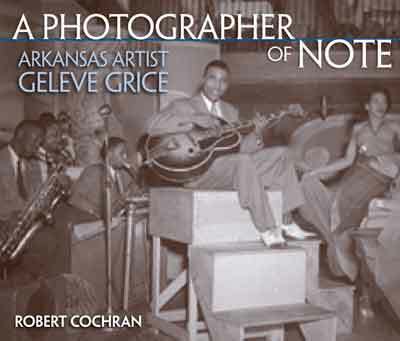 “A Photographer of Note: Arkansas Artist Geleve Grice” chronicles the life of a remarkable photographer and small-town African-American life in the middle of the 20th century. Geleve Grice, born and raised in Pine Bluff, has documented the daily life of his community: parades, graduations, weddings, club events and whatever else brought people together. Through his lens unfolds the story of an African-American community and the daily patterns of segregated Pine Bluff. Grice also captured the excitement of greeting extraordinary visitors to town – Martin Luther King, Jr., Mary McLeod Bethune, Harry S. Truman and others. Folklorist and English professor Robert Cochran worked with Grice to select over 100 black and white images from the thousands of photographs he has taken over a lifetime, spanning 60 years. The book portrays the images chronologically, reflecting Grice’s early years in small-town Arkansas, his travel as a serviceman in World War II and his long career in Pine Bluff. Cochran’s chapters link Grice to the tradition of American community photographers and show how Grice not only made a living taking photographs for jobs, but also made his own life by making photographs for himself and for history.